Nokia X is the new Android smartphone made ​​by the Finnish company Nokia, introduced it at the Mobile World Congress held in Barcelona in February 2014. Nokia has introduced three different terminals: Nokia X, Nokia X+ and Nokia XL. Nokia X / X+ / XL: Qualcomm Snapdragon dual-core 1 GHz. Snapdragon is the platform for smartphones, tablet and smartbook devices created by mobile technology company Qualcomm. 1 GHz represents a not very high wave amplitude, while the two cores (or dual-core) processors are reflected in the ability of processes that can perform in a given time. It means that it makes twice more processes than a single-core processor, this is called MIPS (Million Instructions Per Second). It’s a bit disappointing, considering that the use of four cores is widespread and there are already eight-core processors. Nokia X / X+: IPS LCD 4 inches with a resolution of 800 x 480 pixels. 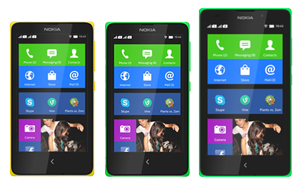 Nokia XL: IPS LCD 5 inches with a resolution of 800 x 480 pixels. Both Nokia X and X+ have a pretty standard display, lower than most of its rivals and with a discrete resolution. The fact that Nokia XL has a 5-inch screen and keep the same resolution as 4 inches is definitely a mistake. Nokia: 4 GB no expandable up. Nokia X+: 4 GB, expandable up to 8 GB with MicroSD card. 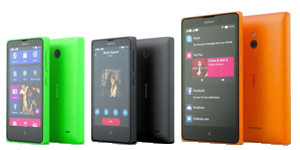 Nokia XL: 4 GB, expandable up to 32 GB with MicroSD card. Storage memory is what is called PC hard drive. In this case the 4 GB memory storage capacity to expand up to 32 GB by adding a microSD card the phone are a bit ower than that of other current smartphones with this display and features. In RAM are loaded all the instructions that processor executes, so the more MB you have the better. In this case Nokia X RAM is below the average, and this makes it a little limited. It stays at 768 MB instead of reaching to 1 GB when theoretically there wouldn’t have been a substantial change in its selling price. Nokia X / X+: 3 megapixel rear camera. 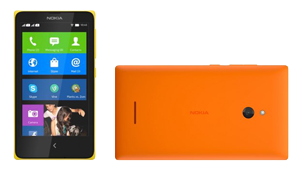 Nokia XL: 5 megapixel rear camera and 2 megapixel front camera. The camera of the Nokia X also has flash. 3G and place for a dual-SIM card. These are all the types of connections it supports. 4G indicates that this mobile uses a system and a third-generation network, converging wired and wireless networks, including Wi-Fi or Bluetooth. In addition to these features, new Sony Xperia Z2 has a 1115.5 × 63 × 10.4 (Nokia X), 115.5 × 63 × 10.4 (X+) y 141.3 × 77.7 × 10.8 (XL) size; in X / X+ models it is significantly lighter than competitive models (128g) and average with Nokia XL (190g); it has a non-removable 1500mAh battery (X, X+) and 1500mAh battery (XL) and features Google Android OS. In short, the new and highly anticipated Nokia X, whose main novelty is Android, is a change for the better with respect to other models in the same range of the company, although the followers of the compalny will be a little bit disappointed. We need a rooted device. Use Gandalf Exploit included in the app Framaroot. Download the Root Explorer app from Google Play. Extract and copy all apk from “NokiaX_Gapps_KashaMalaga_28.02.2014.zip” to /system/app and change permissions for these files. Extract and install as a normal user apks required included in “NokiaX_SomeGoogleApps.zip”. (If you prefer to use Google Launcher at this time, install it). Go into Google Play Store and get an account. Check if your Nokia X / X+ / XL is rooted correctly using our app “How to ROOT”.